Wal-Mart's big attractions for Black Friday shoppers are easily their console bundles. They'll have a Wii bundle that comes with Mario & Sonic at the Winter Olympics, one other game and an extra set of Nyko controllers for $249.00. This deal will only be on Wal-Mart's Web site Their PS3 Slim deal will come with inFamous, Batman: Arkham Asylum and The Dark Knight on Blu-ray. This bundle will be $299, the same price the 120GB PS3 Slims go for by themselves. As for their Xbox 360 deal, well it's going to be perfect for the kids. 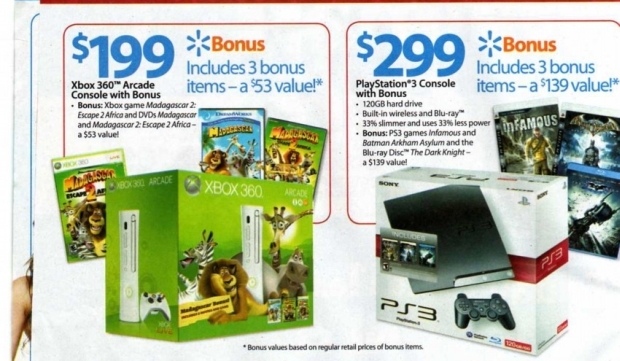 For $199, you'll get the Xbox 360 Arcade with Madagascar 2 the game and the first two Madagascar movies on DVD. Other awesome deals include Nintendo DS Lite for $98, Rock Band Special Edition for $50 (comes with drums, mic and guitar) and over 100 titles starting at $7. Check out the rest of Wal-Mart's deals over on Black Friday info. Anyone hitting up Wal-Mart for a PS3?